presents God of Carnage this weekend. The Broadway piece by Yasmina Reza will have the crowd laughing in hysterics. The arguments between the two lead couples and their children are hilarious! Thursday-Saturday at 7:30pm and Sunday at 2pm, Monte Verde Avenue, Carmel-by-the-Sea. $10-$35. It’s the first Friday of the month which can mean only one thing, First Fridays Art Walk in Salinas! Local shops keep their doors open for art displays, live music, food, family fun and more! 5pm-8pm, Oldtown Salinas. Free event. 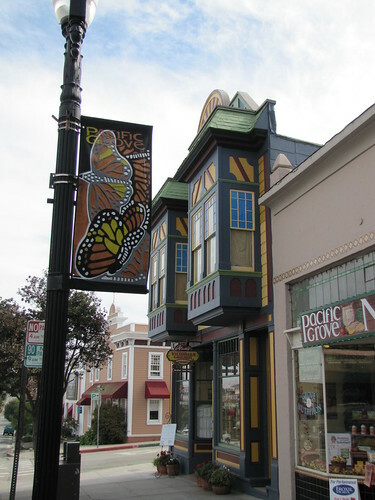 Head to Pacific Grove for yet another art walk showcasing local artistic talents in downtown businesses. The Wine, Art & Music Walk includes several pit stops with live entertainment, wine and light snacks. Complimentary maps are available at the Chamber of Commerce located at 584 Central Avenue. 6pm-9pm, Lighthouse Avenue, Pacific Grove. Free event. Rex Wheeler is back at the London Bridge Pub tonight. Don’t miss his acoustic rock jams. 9:30pm, 256 Figueroa St., Wharf #2, Monterey. Free event. Kick your morning off with a 5-mile walk/run through some lovely vineyards in Salinas Valley. The Winery Walk, Rock and Run invites walkers and runners to participate all in the name of fun and support for the Monterey County Vintners and Growers Association scholarship program. After the walk Paraiso Vineyards will host a grand post-party complete with a delicious lunch, wine and beer, live music and massages. 9am, 38060 Paraiso Springs Road, Soledad. $100 for participants and $30 for spectators. The Del Monte Center salutes members of the military today during their Military Appreciation Day. The family fun event recognizes our brave soldiers and their families with a special breakfast, discounts, activities, live entertainment and a pizza lunch. 10am-2pm, 1410 Del Monte Center, Monterey. Free event. Happy 242nd Birthday to Monterey! One of the most historic cities in California celebrates its B-Day with Le Merienda. The party begins with garden festivities followed by a BBQ and live music. 11:15am, Monterey Gardens adjacent to Custom House Plaza, Monterey. $75 for general public and $55 for MHAA members. The Monterey Bay Derby Dames heat up the track tonight with a bout between Babes of Wrath and the Steinwreckers. It’s sure to be an all out brawl! 7:30pm, Water City Sports Center, 2800 Second Avenue, Marina. $15. Fernwood Tavern in Big Sur hosts groovy trio 7 Come 11 tonight. This unique group plays some funky jams using an organ, guitar and drums. 9pm, 47200 Highway One, Big Sur. Free event. Swing by London Bridge Pub tonight and check out live folk and country music from Kenny Chung. 9:30pm, 256 Figueroa St., Wharf #2, Monterey. Free event. Come one come all to the Cannery Row Block Party! The 9th annual shin-dig is one of the best family events around complete with tons of live music, balloon artists, face painting, games, crafts, animals shows and more! 11am-5pm, Cannery Row, Monterey. Free event.